I guess when metals need to rise it doesn't matter if Armageddon were to be around the corner. Its a form of entertainment just watching these headlines. Half as many as the first lot and 1/4 of what I should have bought on thursday! You knew that was coming with the miners. No juice from Cyprus. Just same ol' pullback after a pathetic spike. I keep watching SLW for direction, and it's keeps telling me to keep my money in my pockets. It's really been trading like a turd the last ten days or so. Down a penny as I type. Bloomberg: "Bullish Bets Jump Most Since July as Gold Rebounds"
"Investors increased wagers on a commodity rally by the most in eight months as signs of a U.S. economic recovery bolstered the outlook for demand and drove rallies in crude oil, cotton, copper and gold." You got anything going on with the you-row/cable? Since you likes the Manuva. Who thinks the next dip is the one to back up the truck on? Though guesses as to what the latest FedSpeak will be could get some life back into the thread. Assuming the Federation will stop nuking Klendathu for long enough for anyone to comment! FYI If you do get comments eaten by the box, you can press back once the site comes back up. Otherwise Ctrl-A Ctrl-C is probably not a bad idea. If you're talking the ES, then every dip is a buy. The sell-off this morning on the Cyprus situation was a buy, period. The fact that price has already rebounded confirms this, IMHO. While the details of the proposed Cypriot bailout are unsettled, with banks closed and the Cypriot parliament expected to make changes to the package, the preliminary agreement has already sent shock waves through Europe, Russia and the global financial system. If approved in its existing form, it would be the first eurozone bailout in which depositors will have to bear part of the bailout burden. The proposal indicates that creditors are willing to risk financial turmoil in order to keep the pressure on troubled countries to apply reforms and contain the rise of Euroskepticism in the north. In addition, the bailout conditions would hit Russian depositors particularly hard, adding to existing tensions between Russia and the European Union over Syria, trade and energy. The terms of the bailout could strain relations between Moscow and Berlin. In the presence of International Monetary Fund and European Central Bank officials March 15, eurozone finance ministers agreed to the broad terms of a bailout package for Cyprus, which in 2012 became the fifth eurozone country to ask for financial assistance from the eurozone's bailout fund. Because the Greek and Cypriot financial sectors are significantly linked, the Cypriot banking sector suffered huge losses with the write-down on Greek sovereign debt holdings enforced in 2012. The proposed Cypriot bailout is the first eurozone bailout to stipulate that bank depositors would partially be involved in the rescue package through a special levy. A tax on deposits is supposed to secure Cyprus around 5.6 billion euros ($7.3 billion) and further clear the way for 10 billion euros in aid money from the eurozone bailout fund and International Monetary Fund. Due to opposition from numerous political parties, the Cypriot parliament is discussing changes to the package to decrease the burden on small depositors while increasing the cost for wealthier savers. In the meantime, the Cypriot Central Bank announced that banks would be closed until March 21 to avoid a bank run. The parliament is also discussing plans to compensate citizens by giving them bonds that are linked to Cyprus' future revenue from natural gas exploration. These measures are designed to calm the Cypriot population, even if it means alienating foreign, especially Russian, depositors. Cypriot President Nicos Anastasiades said that he had to agree to the painful terms because the eurozone would otherwise have withheld aid, resulting in the collapse of the Cypriot financial system and default of the state. The pressure in numerous countries, especially Germany, to ensure that taxpayers' money is not used to bail out other countries has been growing. With parliamentary elections scheduled for September, the Cypriot bailout has become an important topic in the German election campaign, where German Chancellor Angela Merkel is seeking re-election. The opposition parties, which to this point have supported German participation in bailouts, threatened not to support a Cypriot bailout because they claimed German money would be used to protect the obscure Cypriot financial sector and its mainly Russian depositors. To show that German taxpayers are protected and to gain support from the opposition in the German parliament, Merkel's government long argued that bank investors should carry part of the burden. Cyprus and numerous EU officials were opposed, fearing that the bailout would destabilize the financial sector, as was the case when private investors were forced to take a haircut on Greek public debt in order to secure a bailout for Greece. Finding a balance between addressing the Euroskeptic voters in northern Europe while ensuring cohesion of the eurozone is becoming more difficult, especially for Germany, which is facing rising opposition in Europe. In an attempt to calm Cypriot savers, German Finance Minister Wolfgang Schauble tried over the weekend of March 17 to clarify that Germany had argued only for bank investors to be involved in the bailout, not savers. For Cyprus, where the financial and insurance sector accounts for around 8 percent of gross domestic product, the proposed measures will probably lead to a substantial loss in the financial sector and therefore weaken the overall economy. By European standards, Cyprus has a small financial sector and economy -- two elements that limit the risk for the wider eurozone. The current proposal indicates that creditors wanted to ensure that other troubled eurozone countries continue to implement reforms by showing that bailouts will be painful and that cross-border financial aid should be the last resort. Voters who oppose fiscal transfers, especially voters in northern Europe, should be placated by the current proposal. However, depositors in other troubled countries, such as Spain or Portugal, will be increasingly concerned that future rescue measures would result in similar taxes on their deposits. Therefore, any future signs of financial instability in certain countries will likely lead to capital flight and aggravate the crisis further. The tax proposal caught Cypriot citizens by surprise because it is common in the European Union that deposits of up to 100,000 euros are protected by the state in order to avoid bank runs. It is likely that the burden on Cypriot citizens will be reduced at the cost of foreign depositors, many of whom are Russian. Russians have long used Cyprus as an important offshore financial sector. Estimates of Russian deposits in Cyprus range from 15 billion to 30 billion euros, a considerable part of the total 68 billion euros deposited in Cyprus (according to figures from January). After the tax on deposits was announced, Russian officials were quick to advise Russians to pull their money out of Cyprus, and Russian President Vladimir Putin called the tax unfair and dangerous. This comes Putin cracks down on corruption -- largely targeting Russian citizens who hold money abroad. However, the Kremlin is struggling to not go too far with its corruption campaign in order to avoid mass protests among the business and government classes in Russia. The previous Cypriot government tried for some time to get additional financial aid from Moscow in order to ease the pressure coming from Brussels. Cypriot Finance Minister Michael Sarris is expected to visit Moscow in the coming days to discuss potential Russian aid. There are rumors that Gazprombank, the banking branch of Russian natural gas company Gazprom, has offered to help Cyprus with the restructuring of its financial sector in return for natural gas exploration rights. While Russia had previously pledged to be part of an EU-led bailout of Cyprus, the latest depositor tax proposal will strain the relationship between Brussels and Moscow and likely will be an important topic during the meeting between the European Commission and Russian officials March 21-22, a meeting that was supposed to focus on energy and visa issues. If Moscow grants Cyprus additional aid to circumvent the bailout agreement that the eurozone finance ministers worked out, those strains will likely worsen. Relations between Russia and the United Kingdom and France are already tense because London and Paris advocate arms exports to Syrian rebels to counter the aid that Russia and Iran is giving the Syrian regime. There are reports that Moscow and Berlin held a series of phone conversations over the weekend, so there is a possibility that Russia's moves are in coordination with Germany -- or Russia could be through coordinating with Europe since its citizens are being harmed financially. Therefore, the Cypriot bailout has the potential to strain Russian relations with Germany, Russia's most important European partner. Csquared you probably know what I'm going to say. The metals are going up and the Fed will be a sideshow. Of course with the usual volatility surrounding the hairy clown. The roundtrip in crude today has been a sight to behold. i may have spoken too soon on the ES...gap-fill on the intraday here..so now do we roll over? or do we find support here at 1545ish..hmm. Got a buy signal today on AGQ so I have closed out the short and am now long from $39.28. I know someone in the crack business (yeah... the other one! ), would imagine they've been having an exciting time. "This is a nuclear war on savings and wealth." Right now Cyprus is all the rage. Cypriots and the rest of the world are aghast at the explicit confiscation that is taking place. But how different is this than the haircut the Greeks took. That passed and so shall this as the world becomes desensitized to the horror of it all. This will not destabilize the eurozone. A compromise solution will be found as always and euroland will carry on. The Fed is meeting over the next 2 days. Unless they have something original to say about the economy it is expected rates will stay the same. So we should expect once again business as usual. Gold has recently performed better than silver. Have yet to sort out whether silver will take gold down or gold take silver up. I'm leaning toward the latter though won't be surprised if they stay rangebound for the week. 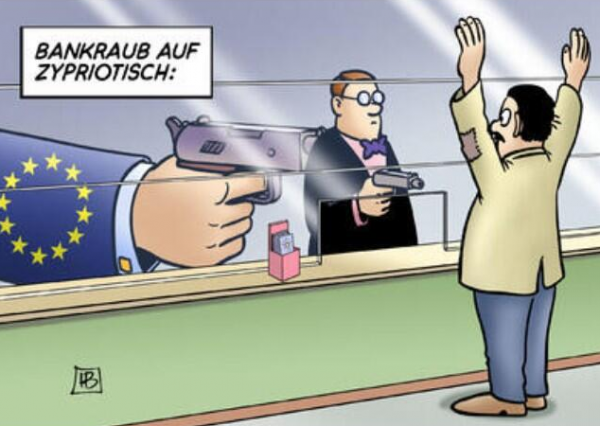 if anyone is not sure, the caption means " bank robbery Cyprus style". thanks Redwood. Thanks Dry (nice avatar) and in case anyone doesn't know that's a European union flag.